As I sit here writing this report on the last day of October it is pouring outside. We have had 190 mm for the month of October and over 1200mm for the year to date up here in the Dandenong Ranges. In addition it has been a cold winter with the flowering season significantly delayed from the norm. We can hope that this is a sign the drought is ending and signalling a return to cooler wetter conditions. The flowering season for rhododendrons has been the best for many years both with respect to the quantity and quality of blooms. It has been a truly magnificent display. 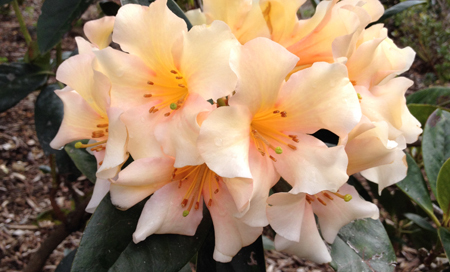 As reported before, from the start of July, entry to the National Rhododendron Gardens (NRG) is now free. At the same time we have gone to considerable effort to publicise the gardens through our campaign to have them declared Melbourne?s Cool Climate Botanical Gardens. The result of these two changes has been a radical increase in garden visitations. So far it is running at between 2 and 3 times last year?s attendances with up to 4000 people per day through the gates. Available car parking spaces are now quite inadequate and the crowds are causing traffic chaos on many weekends up at Olinda. Indeed, on the last few spring weekends, the car parks have often been full by 11 am and the more popular walking paths in the garden are crowded. What this shows is just how significant these botanical gardens are to Melbournians and tourism in general and how important it is that we ensure they are protected for future generations. You can help in the drive to have these gardens recognised as Melbourne?s Cool Climate Botanical Gardens. Talk about the NRG to your friends, make your acquaintances aware of the gardens, where they are and how significant they are. The more people who are aware of them the more significant they become. Every bit helps.